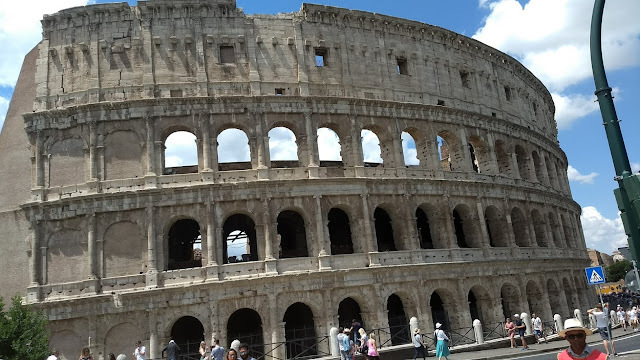 On June 14, 2018, my wife, two youngest daughters, and I rose in our eighth floor apartment in Rome on Via Gallia about a twenty minutes walk south of the Colosseum. We stayed at this place from June 13-16. The owner, who we met, was a very faithful Roman Catholic woman, very bold to call herself a Christian. You could easily see that she was bold in her proclamation to help control what kind of people that might want to stay there. We walked the entire way to the Colosseum. We had walked so much on this trip. It was warm that day, especially compared to the UK and Scotland just a few days before. If I did it again, I would still take a bus. Even though the walk itself isn't too far, it just adds to the total amount of walking through the day. Rome didn't compare to anyplace I've been in the United States. First, nowhere here does America have the ancient history. It's everywhere in Rome. On a regular walk, you are somewhere often predating Christ. It is a tangled mixture of ancient and modern. Second, if I saw something like it and had to describe it, I would call it Italian. It has its own unique Italian flavor, because it is Italian. Even the McDonalds takes on Italian. Every place we walked on this trip, the GPS on our phones helped. I would use the phone to get somewhere and then turn it off once we've arrived to save the battery. Half the time, I needed someone else's phone on a trip home in the evening. The GPS usage ate up my battery power. We gradually ascended a narrow road, the crown of which overlooked the Colosseum, which lay lower in a valley area. Topping the crest and peeking the Colosseum astounds at first sight. It is such a complete, whole piece of history, in a condition like it could in little time get back up for business. 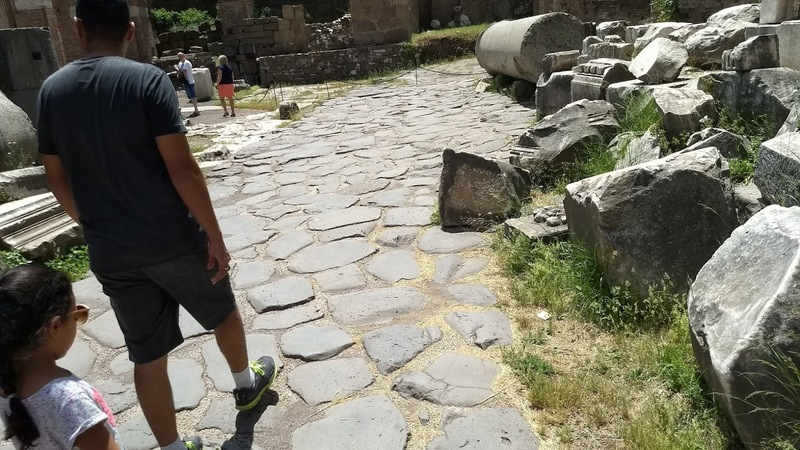 We crossed a main street with now a throng of pedestrians, to the modern sidewalk leading around and down toward the outside of the Colosseum. We had already paid for tickets and a time. The outer area is large and crowded with tour guides and trinket sellers confronting with their business. The entrance to the Colosseum is in the Colosseum as if it was a modern stadium. We found the line for those with tickets, which really shortens the time, and we got in fast. We used the Rick Steves mobile travel app for our tour. We four had phones and we took the tour together. Steves himself gives appropriate commentary to give you the basics of what the Colosseum is about. 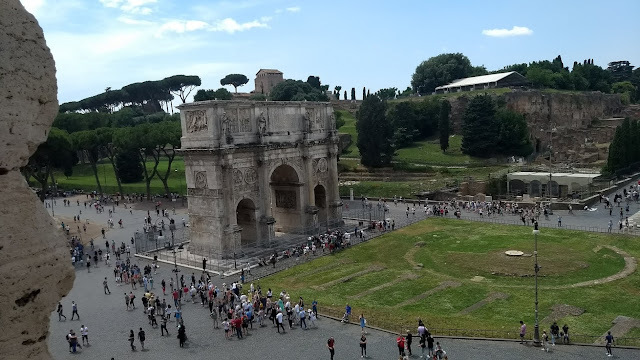 While walking through the Colosseum, plenty of openings offer various sites on the outside, including the Arch of Constantine, an impressive feature just outside in the direction of the Palatine Hill. The Colosseum wows with the knowledge that this is not facsimile. We are walking up and around on the stones where it all really happened in Rome a few thousand years ago. It is immense and preserved. 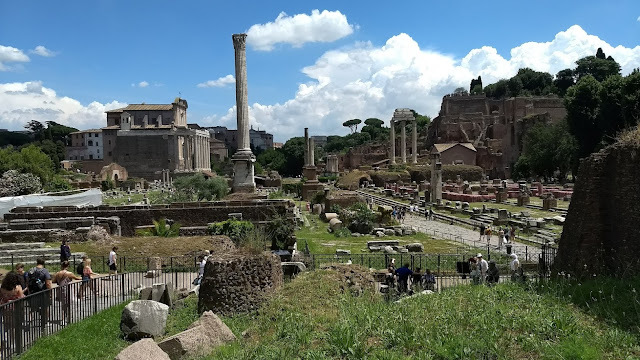 As we walked out of the Colosseum, there is plenty to see in the same area, because you are right in the center of Rome, the classic seven hills of Rome, which includes Palatine Hill, the location of the palaces of Roman emperors. 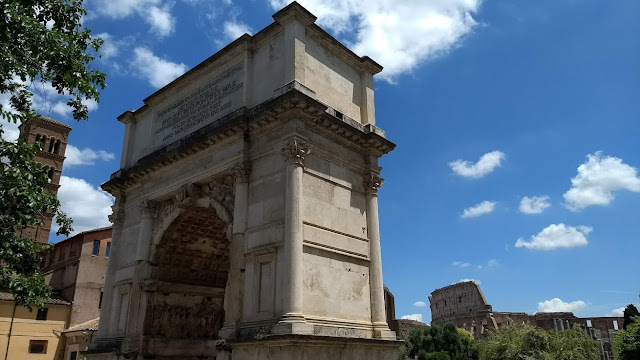 There is the Arch of Titus, hippodrome, the temple of Venus and Rome, the palaces of Domitian, Augustus, and Tiberius, the house of the Vestals, the temple of Castor and Pollux, the Roman Forum, the place of Julius Caesar's burial, and the Via Sacra, the main street of ancient Rome. The Roman general Titus, who later became the Roman emperor Titus, destroyed Jerusalem in 70AD and he brought back the pieces of furniture from the temple there, as seen carved into his stone arch there at the start of the Via Sacra. 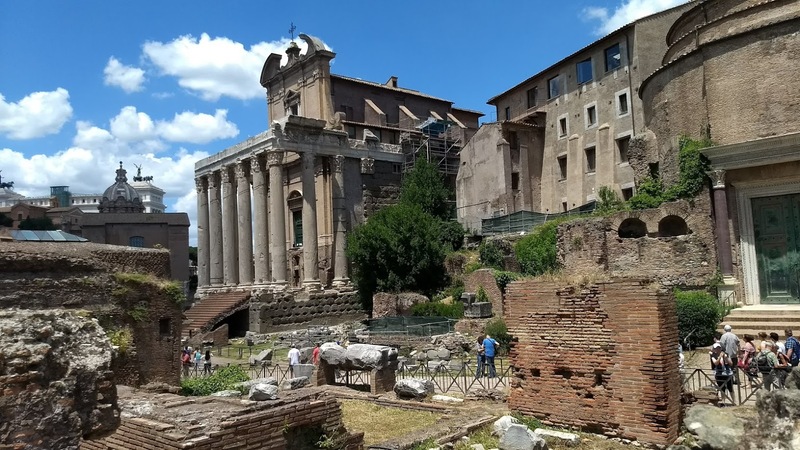 After looking at these ruins, we took a bus back to the area of the Pantheon and ate before visiting the inside of the Pantheon. 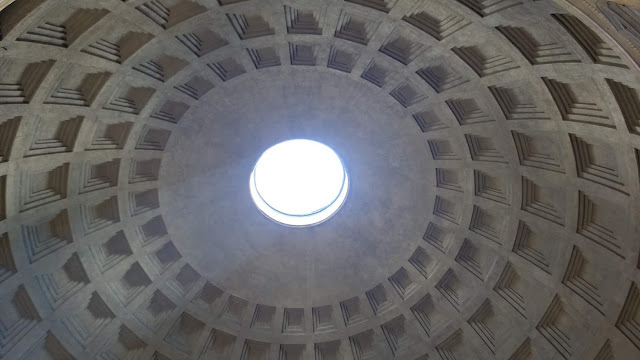 The Pantheon is the most pristine ancient building in Rome inside and out. 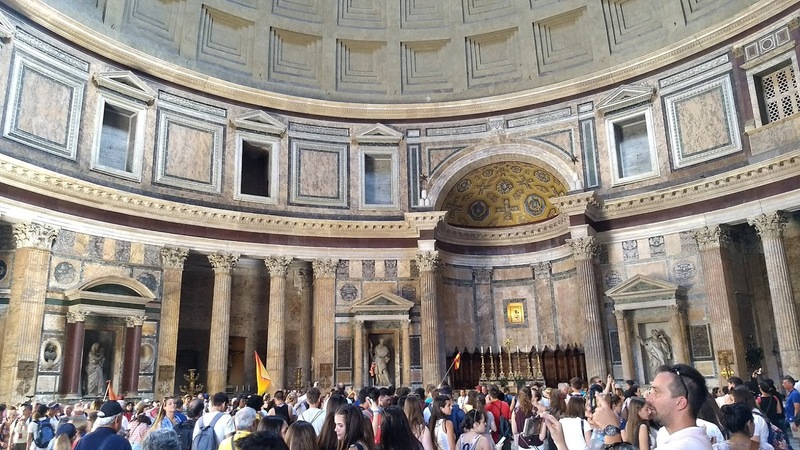 It was commissioned before Christ and finished by Hadrian in 126 A.D. It was a pagan temple, but today it serves as a burial place of some of the most famous more modern Italians, including Vittorio Emanuele II, the first King of a united Italy, and the artist Raphael. We got a lot covered on that Thursday with a little more for Friday in that general area and then a later night tour of the Vatican museum. We had the chance to visit a couple of years ago. I took the very same pictures that you have posted here. Did you visit the Mamertime prison, just right around the corner from the old city center? For me, that was the neatest place we visited in Rome. I would have liked to visit there, but we were in Rome not long enough. I'm glad you could go. Thanks for the comment.